This blog is about how, why and where to find old paths, trails, and roads in Virginia and the Carolinas. The short version is that one finds these old traces so as to identify archaeologically sensitive ground. You may be surprised to learn just how much remains of the 16th, 17th, and 18th centuries. Through this blog we hope to engage your imagination and perhaps even your hands in the largest recovery project ever attempted in North America. 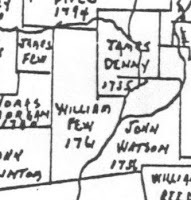 The brothers Few, James (1703-1787) and William (1714-1794) arrived on the banks of the Eno River in Orange County, NC in 1758. Odds are good that one or both had previously visited the area to scout out land. It is also likely that, being Quakers themselves, they were acquainted with or even associates of Herman Husband (1724-1795), a Quaker real estate hawker, later, a leader in the Regulator movement. They arrived in Orange at a pivotal moment in that county’s history involving a contest of wills between the 99% and the 1%. When the Fews arrived, North Carolina’s governor, Arthur Dobbs (1689-1765), keeping a promise made during his job interviews, was in the midst of establishing Anglicanism as the colony’s official religion in a colony in which Anglicans were a miniscule minority. Perhaps he became governor owing to his family’s long experience doing this sort of thing in Ireland. His zeal for his church and his class would eventually destroy the Fews in North Carolina but not in history. 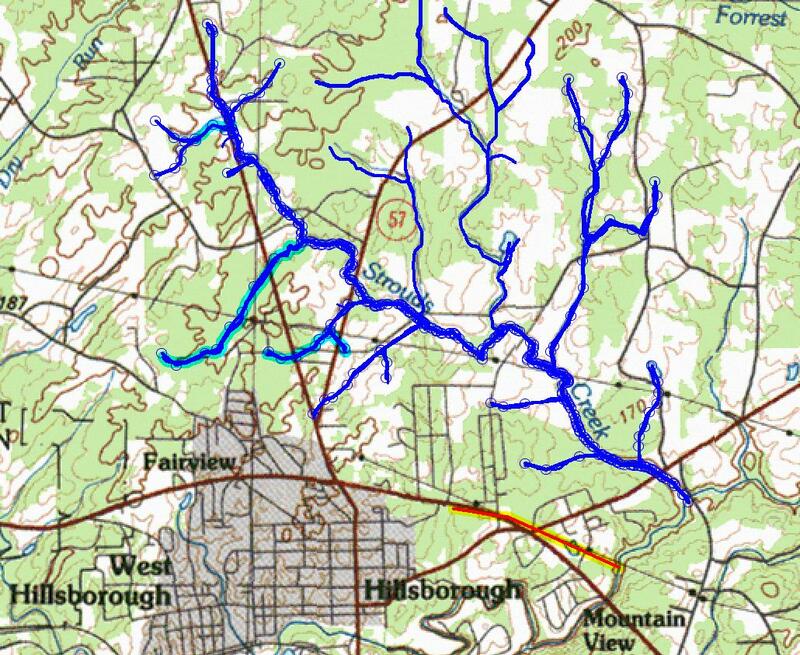 James, it seems, was more the industrialist and William more the legalist but they shared in their family commercial endeavors; a mill and inn on the Eno in what is now Eno River State Park (see the above map). William, perhaps to pursue a legal career, perhaps to protect family interests in an environment increasingly hostile to dissenters, acquired land a mile from Hillsborough along the Halifax Road, one of the roads leading to the family mill and inn. 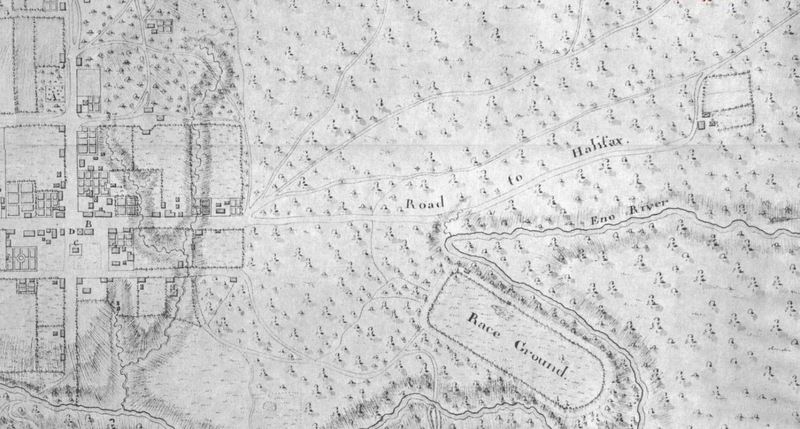 This 1768 map shows William Few’s farm on the road to Halifax, east of Hillsborough. In fact, most of the land surrounding Hillsboro was owned by Quakers. Quakers owned most of the valley of Stroud Creek (shown at left) which wraps around the east and north sides of the town. Their meeting house was located on the “trading path” north of town (now Hwy 57), on the east fork of Strouds Creek. To the west of the town, on the Eno, was another successful, Quaker commercial operation, Joseph Mattock’s factories, again, on a major commercial artery. Those successful competing operations intercepted commercial opportunities that might otherwise have traded in Hillsboro so it is quite likeley that Hillsboro could not successfully compete with the better placed, Quaker commercial centers. 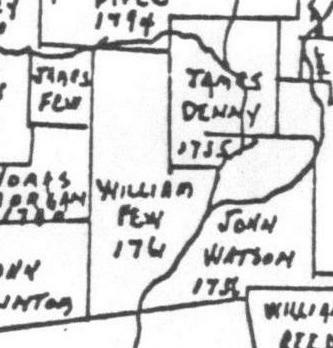 In the end the Anglican minority won, William Few and virtually all the Quakers in the vicinity of Hillsboro (and friends of Friends, like President Jimmie Carter’s ancestors) pulled up stakes and left Orange County for Georgia in 1771. In that year was fought the “Battle of Alamance”, a violent confrontation between Governor Dobb’s successor and Regulators” from Orange and neighboring counties. On the scene of that battle, William Few’s son, James (named, we suppose, after his uncle), was singled out from the hundreds of Regulators and summarily executed. Back in HIllsboro, a few days after the battle, the Governor’s army tore up William Few’s crops and his fences and utterly destroyed his farm. Because control of government yields control of official documents, the basis for most historical narratives, we probably can never know for certain why Governor Dobbs planted an Anglican town and church in a majority Quaker settlement . But the historical context of the founding of the town and subsequent actions that resulted in the exodus of almost all of the Quakers in and destruction of all competing commercial centers makes it easy to surmise that the real motive for relocating Orange County’s courthouse in 1754 and for creating an Anglican parish in a district dominated by dissenters was to rid the county of its Quaker and its competitors. If that was the motive, the result was singular success. What Followed: James Few, too old to migrate again, stayed with his mill until his death. William Few was a leader in the great migration, and his other son, William, became a leader in the American Revolution and a signer of the Declaration of Independence for the new state of Georgia. Herman Husband later rabble roused other farmers before and during the Whiskey Rebellion a few years after the Revolutionary War, when President George I enforced a tax to put his distillery competitors out of business. Arthur Dobbs died while packing to return to England, probably from something to do with his spleen. Today’s hike will pass through a village that grew up next to Few’s mill and will take us to the likely site of Few’s tavern. One site we’ll visit may actually have been James Few’s house site. 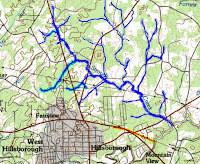 The hike will be roughtly 1.5 miles long, almost all on park trails. 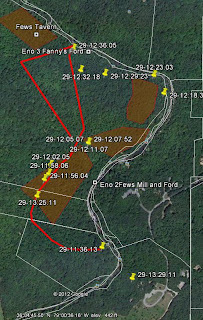 The map shows the course of the hike as a red line and the shaded areas are zones of occupation containing remains of dwellings or businesses. 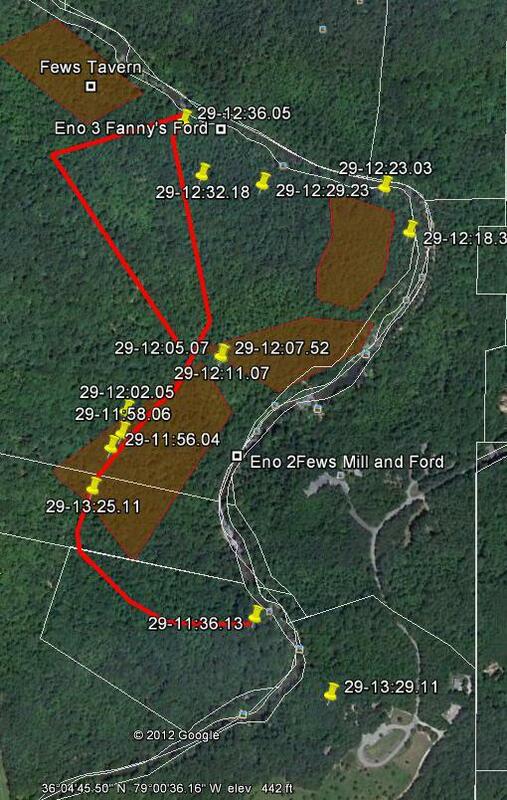 Each of the yellow pins marks a point of interest; graves, chimney falls, and other artifacts of a time long gone by. We hope today you will find a new way to look at our land and our common past.